Any visit to France will include a considerable number of visits to famous French buildings. The difficult thing is choosing which ones to go see and which ones to leave behind. If you tried to see them all, you'd never sleep and never get to enjoy the fabulous French cuisine, so make a selection before you go. There are many different types of famous French buildings. The churches in France are, for the most part, breathtaking Catholic cathedrals. The castles (châteaux) are seldom fortified castles with a moat and a drawbridge like in the fairy tales, but when you get up close to them or venture inside, they are every bit as magical as you expected. Whether you're planning to stay in Paris and see the city and its surroundings, or you are planning to tour many regions of France, there are more than enough architectural wonders in France to fill your camera's memory card, perhaps more than once! Some of the most famous buildings in France are in Paris, but many are not. Take this geographical element into consideration when planning your trip to France. The church of Notre Dame in Paris (seen at left) attracts scores of visitors every year. You can tour the church, meander inside, or simply take a picture from the outside. Masses should only be visited respectfully, but newcomers are welcome. 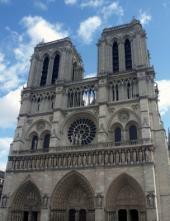 This is the church where Victor Hugo's Notre Dame de Paris (The Hunchback of Notre Dame) takes place. The Cathedral in Amiens (about 50 miles north of Paris) is the highest cathedral in France, and one of the oldest as well. The cathedral, though a fair distance from Paris, attracts many visitors because of its historical and architectural importance. 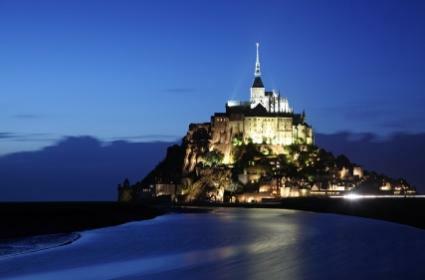 The Mont-St-Michel is an abbey (pictured at the top of this page) that dates back to the year 708. Over the years, it became a bigger and bigger religious building, and nowadays the rock between the swirling tides of the Norman/Breton coast features a long tourists' causeway where every type of café, restaurant and tourist shop can be visited while walking up to the Abbey or back down again. Many famous French castles are worth a visit while touring France. Some favorites are the castles in the Loire River Valley. In addition, in the southern region of France, there is an old fortified city: Carcassonne which is beautiful from afar and fascinating seen from inside. Perhaps the most well-known French museum is the Musée du Louvre, which houses an astounding amount of artwork in several different formats. Visiting the Louvre is like visiting Disneyworld in the sense that you can never see it all in one day. Buy a multi-day pass, or look at the map before you start wandering so that you are sure to hit the wings of the museum that interest you most. Also in Paris, the Musée d'Orsay is a much more recently opened museum (1986), with a smaller, more manageable collection. 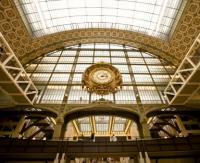 In addition, the building itself has an interesting story because the building was originally a train station. In the image at right, you can see the original clock in the museum; like all European train stations, a big clock reigning over the main hall was a required feature. As you can see, even if you don't leave Paris, there is a wide range of famous buildings to enjoy. Of course, if your schedule permits it, visiting other regions of France is also spectacular, plus you get to enjoy the beautiful French countryside while traveling between regions!